Produce Alliance plays a pivotal role in the industry by updating our partners on the latest market alerts, food safety updates, and “Good Buys” within the market place. 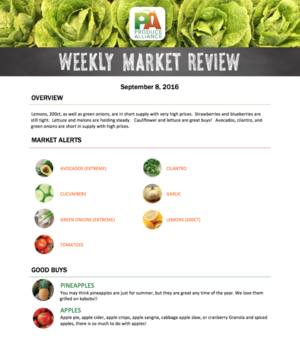 The PA Market Report is a weekly update distributed every Thursday that gives more insight into the state of our industry’s top fresh produce commodities from a quality, pricing, and supply standpoint. Stay updated on important market and industry news on your produce items with our Market Alerts.